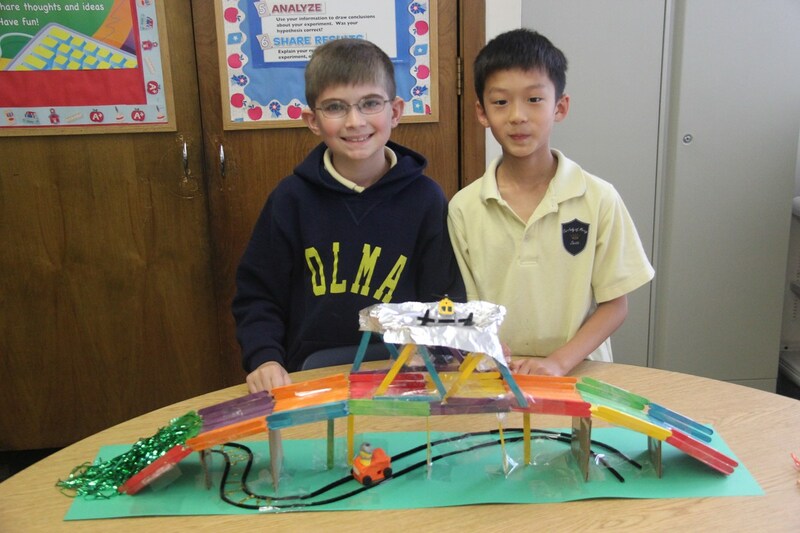 Cross-curricular learning with Mrs. Johnson and her 3rd grade Engineers! Our third grade spent time speaking about the story of “Billy Goats Gruff”. This discussion was followed during their Spanish Lesson by reading “Los Tres Chivitos Gruff”. The children were then grouped in pairs and were asked to make a plan to build a structurally sound bridge that could hold the ‘goats’. First, they planned and wrote down their ideas. Next, they used a variety of materials to construct their bridges. Keeping at the process until they felt confident they had achieved their goal. Last, they took turns presenting their finished bridges to the class and shared their successes and the things they felt could be improved upon. This sort of cross-curriculum integration will become more profound next year as we introduce our Makerspace. Students will be more frequently exposed to learning that is collective rather than single separated subjects. This approach exposes students to collaboration and critical thinking skills that are important for their academic growth. Well done THIRD GRADE! We can’t wait for you to get into our MAKERSPACE!